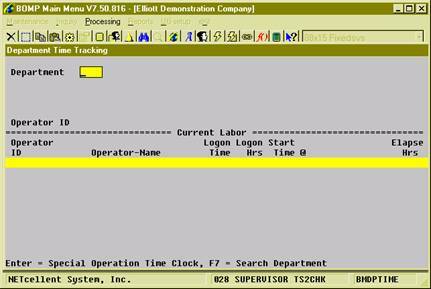 This is the Time Clock Interface for a Department. It allows an operator to clock into a department and the labor will be shared to all currently active work orders in the department. This interface is similar to Work Center Time Clock, but this one is for department managers or operators that monitor all machines in a department. This interface has 2 stages. In the first stage, a department is selected. In the second stage, the operator will clock in or clock out. The second stage is repeated. An operator must first select a department for this interface. Press F7 to search available departments. The department field may be left blank if you want to start an activity for a special operation, like a break or meeting. 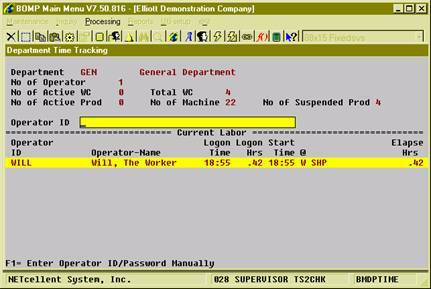 This can be used at the beginning of the day when no job has been assigned to the operator. Once the Department ID has been entered, the system will display all operators who are currently working in this department, including those who clock into a work center and those who directly work on a work order. The system will show basic statistics about this department under the department field. The system will prompt for an Operator ID and password. The operator can toggle between scanning mode and manual mode with the F1 Key. In manual mode, the operator can use the Up and Down Arrow Keys to select an operator ID. The operator will be clocked into this department if not clocked in. Otherwise, the system will provide a list of special operations for the operator to perform next.